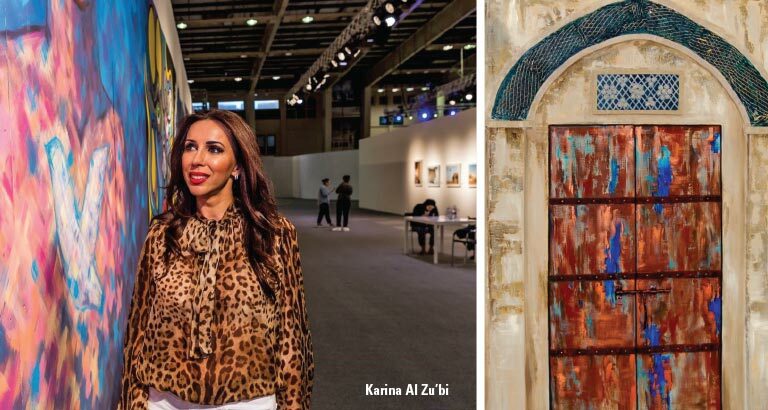 Through her new venture, Karina Al Zu’bi shares her passion for fine art with the larger community. She tells Behnaz Sanjana about her arty endeavours and the road she plans to tread. Located conveniently in the pleasing precincts of Palm Square on Budaiya Highway is Karina Zu’bi’s Paint & Palette Art Studio. The studio’s interior is usually scattered with canvases spanning various sizes, their splashes of colour standing out against the spotless white walls. Karina is the owner and mastermind behind Paint & Palette, which opened in March this year and has quickly become one of Bahrain’s premier art studios, with a strong focus on art education for adults and children from all walks of life. “Our classes are taught by expert teachers and are tailor-made to suit different levels, ages and abilities,” she says. A common aspect of each class is the fun and relaxing environment that the studio provides its students. The children’s classes are suitable for youngsters from age seven and up. They learn the basic fundamentals of fine art, like composition, pattern, perspective, tone and mixing of colours. They are given the opportunity to experiment with and explore various mediums such as acrylic, charcoal, pencil, pastel and collage work. “Each class focuses on imparting knowledge and skill sets, with an emphasis on the principles of art,” adds Karina. “It is a great way to build a foundation to enable kids to confidently find their own style.” The classes are offered as a set of eight sessions, lasting two hours each. Paint & Palette’s sessions for adults have proved to be a therapeutic experience for many, including those who are complete novices. “A lot of our students come to enhance or add onto their artistic competencies and techniques,” says Karina. “Established artists who are planning to hold exhibitions are also part of our classes. A naturalised Bahraini through marriage, Karina says that her artistic abilities developed informally when she was very young. She was inspired by the beautiful surroundings of her home, the sounds of musical instruments, her affection for yoga and her loving family. Her studies and travels took her to Australia and eventually brought her to Bahrain. Although yoga, her marriage and children have been her focus for the past several years, her inner artist was waiting to manifest. She says: “I was instantly fascinated by Bahrain when I came here, and the mysteries of Dilmun captivated my heart and imagination. It set me on a journey to unravel the origins of ancient civilisations and dynasties, which are reflected in my art. Going forward, Karina wishes to extend support to special needs children, with monthly and then weekly art classes for them. The studio has already supported the Art for Autism Awareness initiative that took place in Bahrain earlier this year and participated in a tourism event at Bahrain University to promote the country. Karina looks forward to being part of the Annual Bahrain Summer Festival 2018 organised by the Bahrain Authority for Culture and Antiquities. Her work can be seen on Instagram @paintandpalettebh.